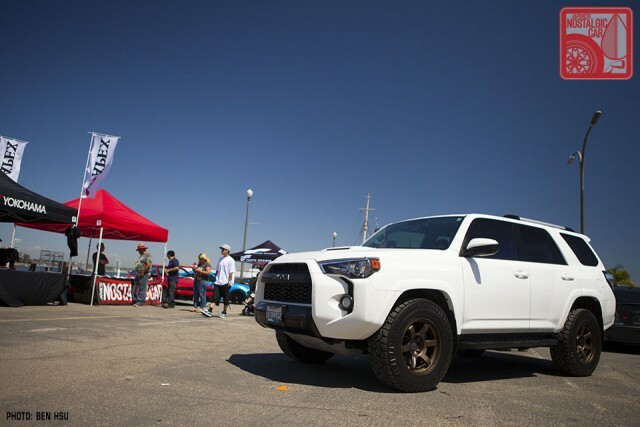 In the final installment of our 2015 Toyotafest coverage, we take a look at two types of vehicles Toyota is known for — its compact, rear-wheel-drive sport coupes and its famously indestructible workhorse trucks. The former once dominated the company’s lineup and the latter still lives on, and both are fast becoming classics. 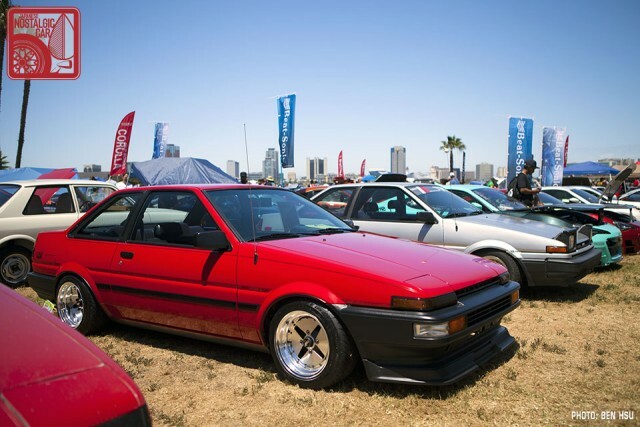 We’re starting to see more Sprinter Trueno conversions on TE27s. What’s rarer are these rare zenki (pre-facelift) versions with the hexagonal grille and headlight bezels. The owner has also fitted the obligatory Watanabe wheels on it, but in this case it’s the less common 4-spokes. Beside it was a RHD kouki (post-facelift) Sprinter Trueno. It’s refreshing to see a TE27 that’s not the usual orange or dark green, and the unusual dark purple shade fits it well. 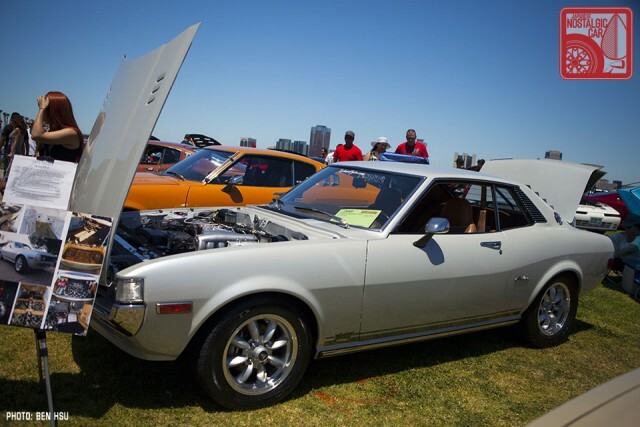 There was no shortage of Celicas, and though many of the bone-stock Liftbacks in attendance have been seen at past Toyotafests, it’s good to see the ultra-clean ones returning in original form. 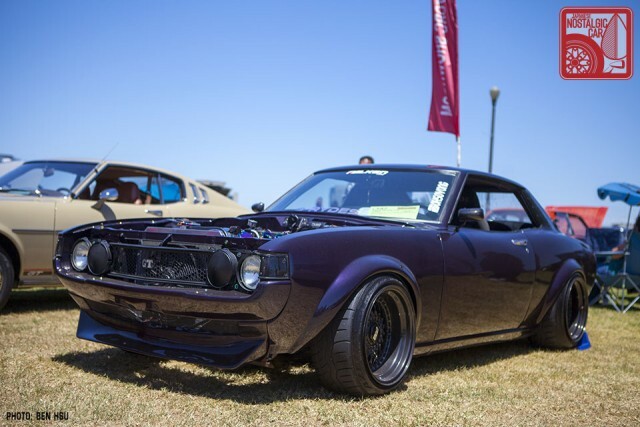 Peter Vong’s RA24 is one of the most insane Celica builds in the states, with a midnight purple paint job that looks black hole-deep and custom BBSes to match. We first saw Peter’s car at the SpoCom show last year, but its open ITB setup on an F22C plucked from a Honda S2000 never ceases to amaze. It seems as if the heavy mods are going to the post-facelift snub-nose Celicas and we applaud that trend. 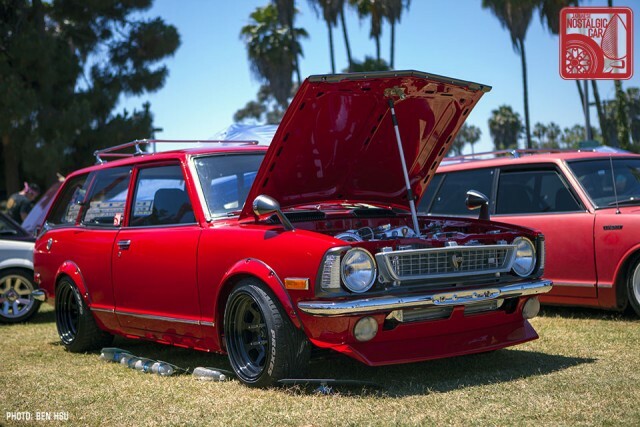 This 1977 keeps all the mods within the Toyota family but it’s no less insane. 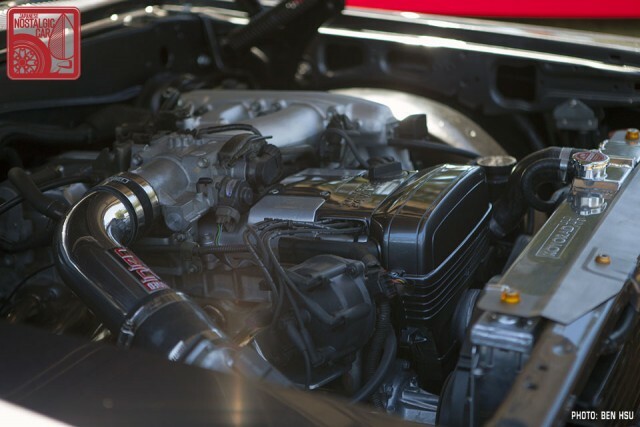 Crammed under the hood is a 2JZ mated to a Lexus IS300 W55 that sends power through a MkI Supra axle. An A60 Celica donated the front struts and spindles for a T3 coilover conversion, the steering and sway bars are from an E70 Corolla, and the paint is Glacier Frost Mica from a Lexus GS. It also has some spiffy cosmetic features such as a back-dated C-pillar vent trim and emblems, as well as a small bumper conversion. 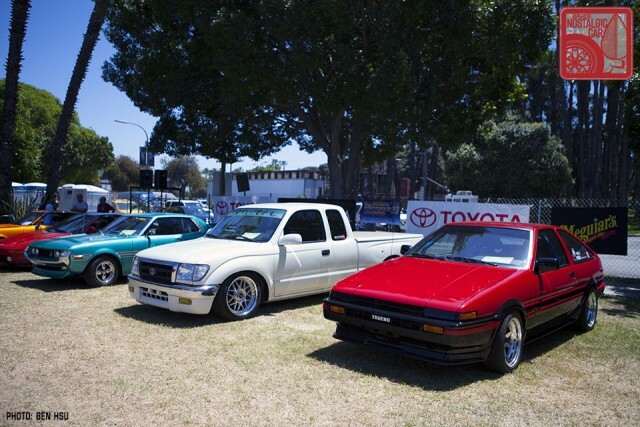 The gloriously boxy Celicas and Supras of the 80s were well represented. Daniel Hernandez’s Supra looks to be a particularly appropriate car to take to the opening of Mad Max: Fury Road tonight. 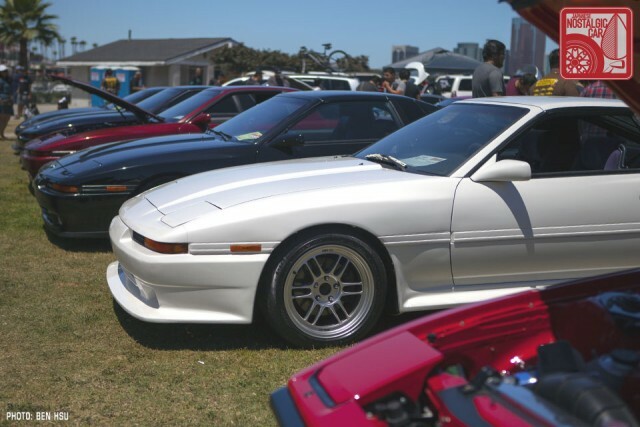 We saw an impressive gathering of Supras in Part 02, but the number of clean A70s nearly brought a tear to my eye. 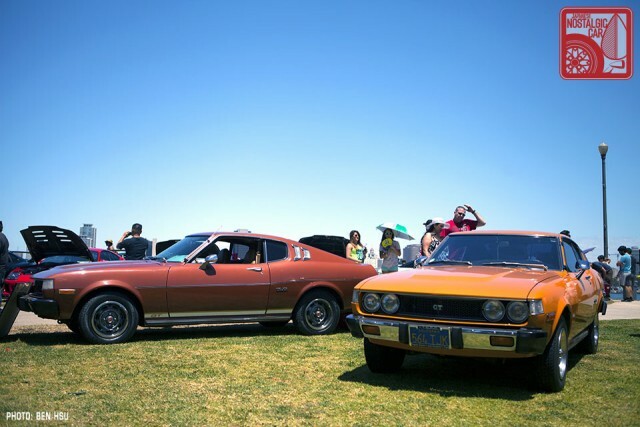 As anyone living in SoCal knows, these once proud flagships of the Toyota marque are rarely seen in the wild, and when they are they’ve usually been beaten to hell. 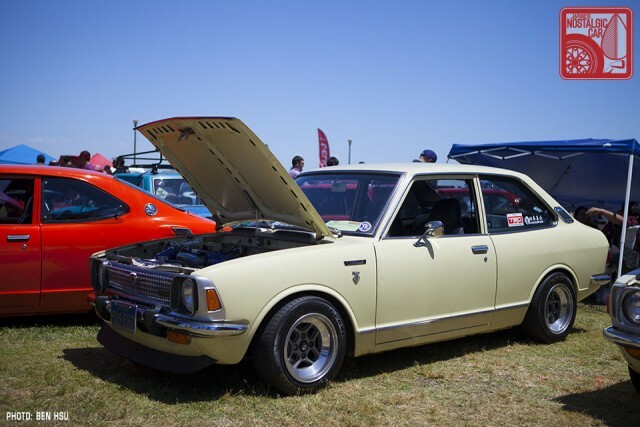 In a row of E20 Corollas, this simple “peanut” on TOM’S Igeta wheels stood out. Sure, the TE27 “mangos” are more sought-after, but a well done TE21 should not be overlooked. 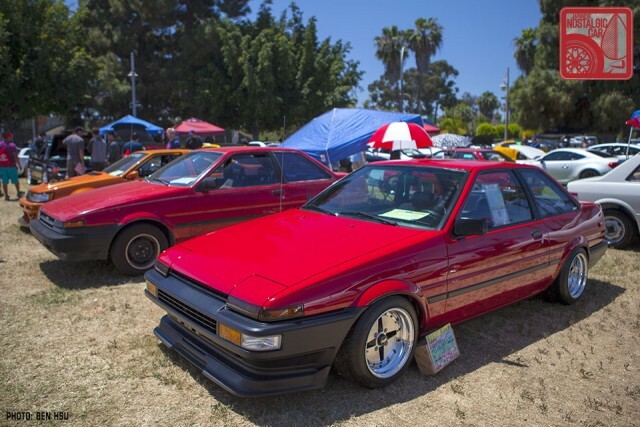 The RHD orange import beside was a great addition to the lineup as well, one that we first saw at AE86 Nights. There were even a couple of rare TE28 wagons, one of which bore the air dam and exposed-bolt fender flares more commonly seen on tricked out TE27s, and some sort of intercooled turbocharged monstrosity behind the grille. No one ever suspects the wagons. 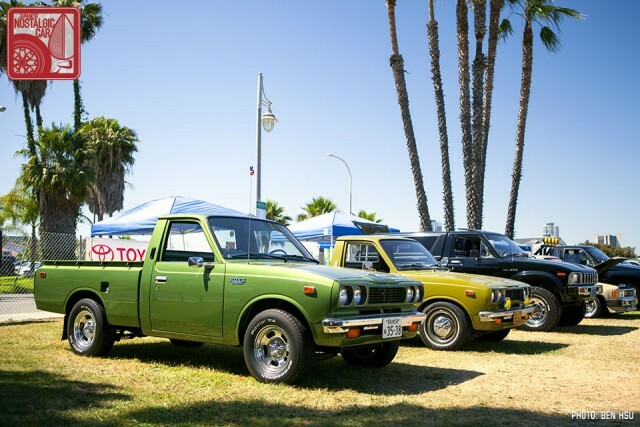 A great number of trucks could be found on the Queen Mary lawn this year, including a pair of Hiluxes painfully green in the way only 1970s greens could be. If any plain old workhorse truck could be considered beautiful, these candidates would be first in line. 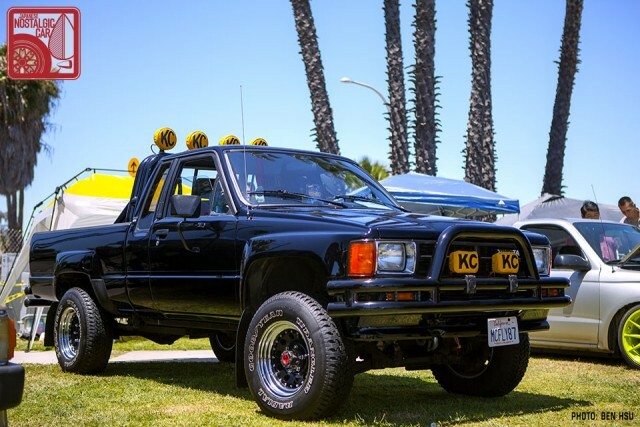 Jack Russo’s 1987 Toyota SR5 XtraCab, a spitting image of Marty McFly’s dream machine from Back to the Future, made its second Toyotafest showing, drawing many fans. A truck just like it was only in the movie (and its sequel) for a few seconds, but the impression it made was everlasting. However, if we had to choose one Hilux to take home with us, it would be this short-bed 4WD, complete with period correct camper top over the rear bed. Resplendent in black and these solid front axle go-anywhere machines are all the truck you’ll ever need. Finding one not abused is hard enough; one this mint is a unicorn. The 4Runner started as a pickup with a detachable roof. Now it’s one of the few body-on-frame SUVs remaining as the rest of the auto industry shifts to crossovers. The 4Runner TRD Pro is perhaps the ultimate expression of the model, Toyota’s own factory-built desert bounder. It comes with a skid plate, off-road dampers, and a classic Helvetica grille in place of the ovals. Finished in all white with Volk TE37 off road wheels, it’s ready to tackle Imperial walkers on Hoth. 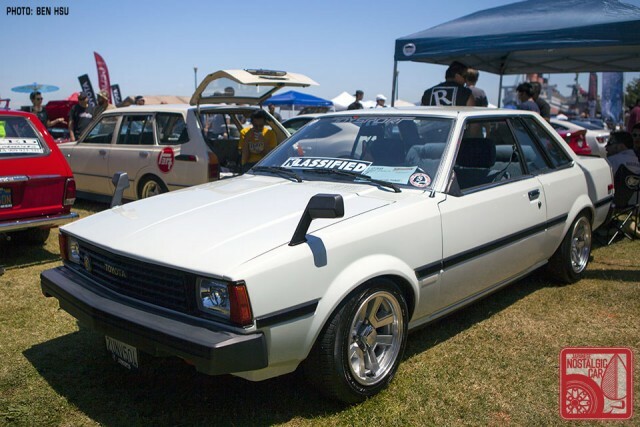 The TE72 Corolla Hardtop Coupe is one of our favorite body styles, and Joseph Pelayo’s 1982 is a perfect example of a clean stocki-ish cruiser that does not need loud paint and fender rubbing stance to look sharp. Our favorite touch is the “Rolling Guy” sticker in the window. How many will get that reference? With most of world’s supply of the Corolla GT-S either destroyed or bought, it’s no wonder that the Corolla SR5 is now being seriously coveted in the same way GT-S AE86s once were. What’s more, enthusiasts are even snapping up automatic SR5s now as both of the ones in this photo are. Cars that used to be discarded for not being a “real GT-S” are getting the show car treatment now. 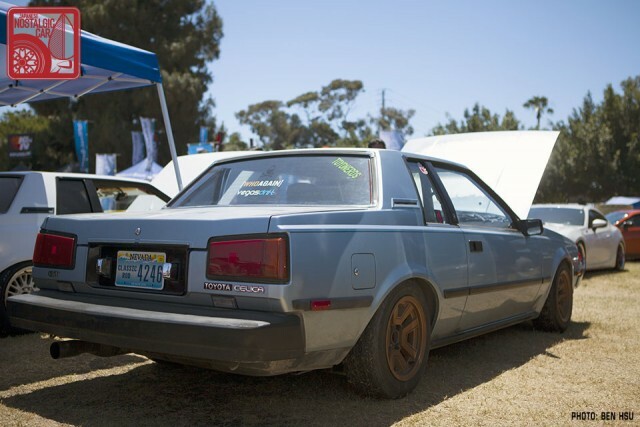 Being an AT SR5 didn’t stop owner Humberto Pena from building a fantastic looking Hachiroku with kouki JDM bumpers. The presentation was especially nice with the car’s original window sticker ($11,061 out the door) and Work Equip 02s straight from Japan with the original “for sale” sign like the kind one might find at Up Garage or Autobacs. 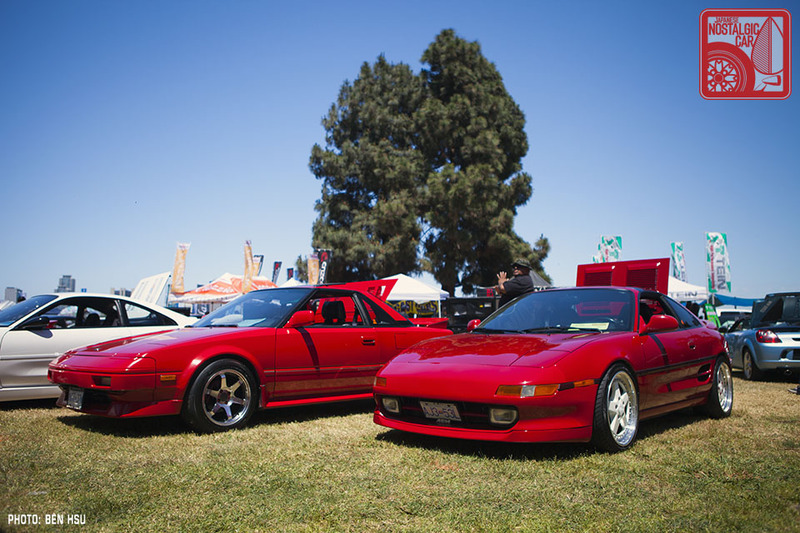 Another model that came out in full force to celebrate Toyotafest’s 20th anniversary was the MR2. 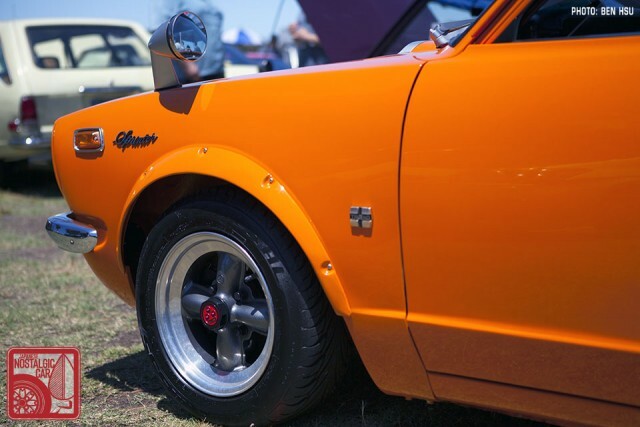 Not only did owners of the midship runabout bring out their cars in numbers, they collectively get the award for most hard-core drivers. 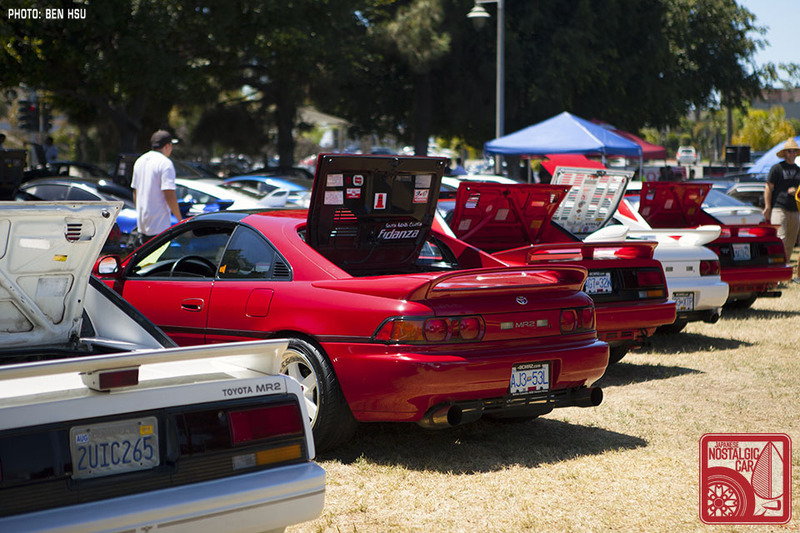 Fewer clubs showed as much pride as the British Columbia MR2 Owners Group, which drove all the way from Vancouver, Canada in a fleet of AW11s and SW20s numbering in the double digits. That is dedication. However, the furthest distance traveled award goes to the owner of this AW11, who came all the way from Chicago and was even forced to take a several hundred-mile detour as a result of snow in the Rocky Mountains. 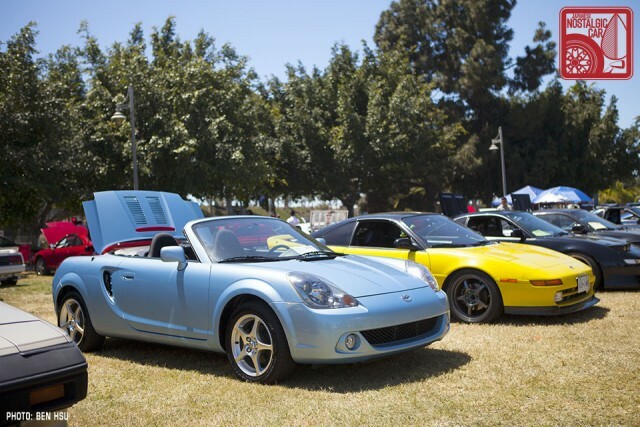 The owners of this gorgeous Paradise Blue MR2 Spyder took the opposite approach. This 2003 model year roadster has less than 10,000 miles on the odometer. A future kidney car, perhaps? 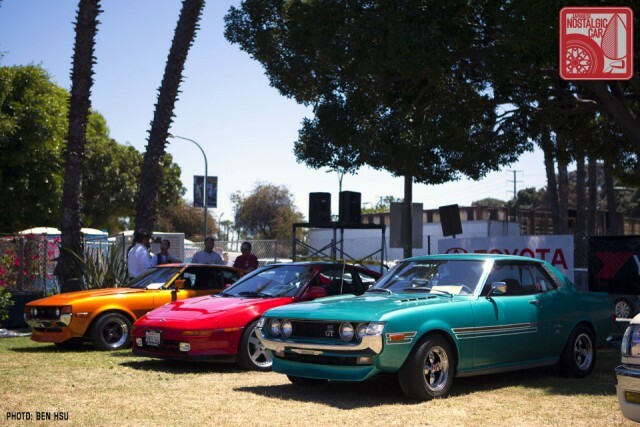 The Cruise Nisei corral represented old school style with Janet Fujimoto and Duane Tomono’s immaculate matching red AE86 hatch and SW20, Paul Matsushima’s Daruma Celica, and Brian Karasawa’s orange Liftback. 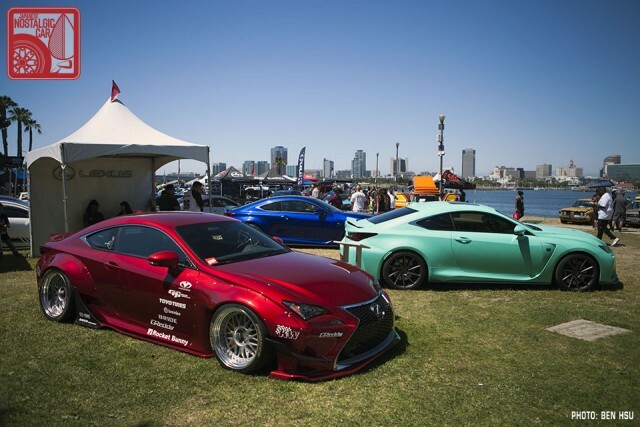 Nearby, the Lexus display showed off a trio of new RC sport coupes. 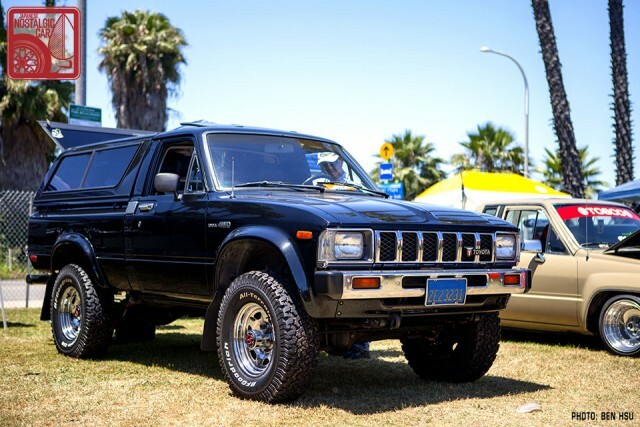 One of the special displays at this year’s Toyotafest was a tribute to Marv Specter of Specter Off-Road, the huge Land Cruiser shop and parts depot in Chatsworth, California. Specter passed away in January last year after losing a battle with cancer, but his memory lives on with a huge group of customers and friends that shared a love of Land Cruisers. Marv had a huge collection of Land Cruisers from all over the world, including this fire truck conversion from Japan. 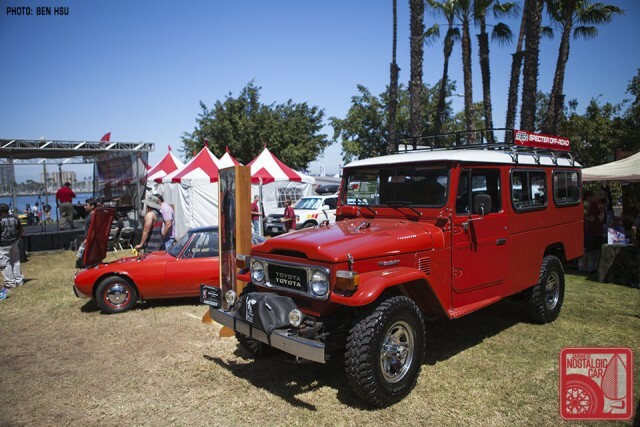 Based on an Japanese FJ62 high-roof, the back half was chopped and converted with a deck for firefighters to stand on. 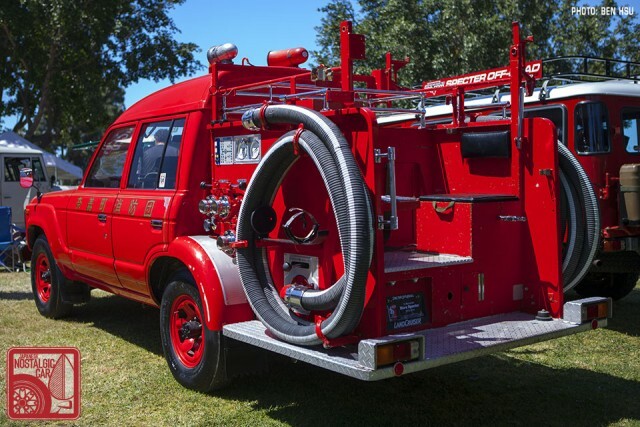 Notably, the Japanese FJ62s were still being offered with carbureted engines, and this fire truck is equipped with such. Many fire trucks in Japan come with a pump system that doesn’t depend on hydrants. The giant feeder hoses are dropped directly into a nearby lake or river and extracts the water from there. Another Land Cruiser from Specter’s collection was an FJ45 “Troopy,” called as such because the extended rear had two longitudinally mounted benches like a military troop carrier. This particular one came from the UAE and was rumored to have been owned a royal family. From the very large to the very small, Spector also had a fondness for the Sports 800, and bought one after discovering the model on a trip to Japan This is a rare left-hand-drive example. 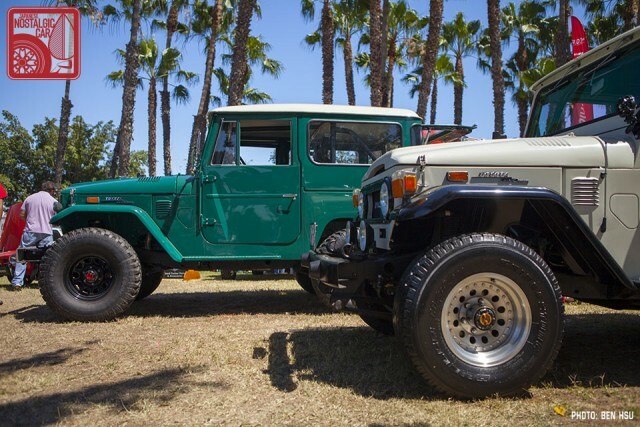 Chris Millard took Best in Show in 2012, surprising everyone with an amazingly meticulous 10-year FJ40 restoration. Since that debut win, he’s gone over the engine and interior again, making it even more flawless than before. Nearby, Jeff Koch’s Diecast Cars booth had a king’s ransom of toy Toyotas. 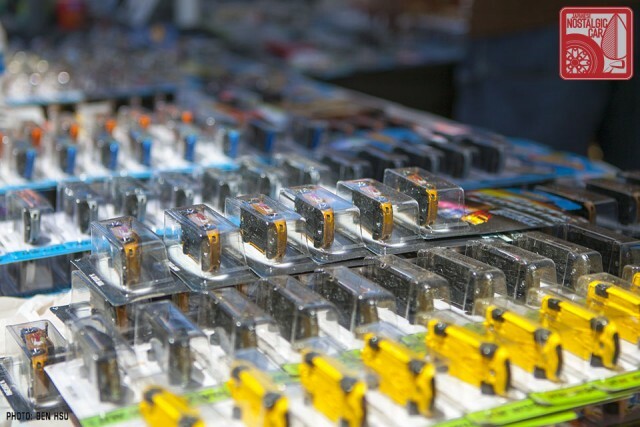 From Hot Wheels to plastic Japanese model kits to gachapon capsule prize cars, there was every type of Toyota you could imagine. 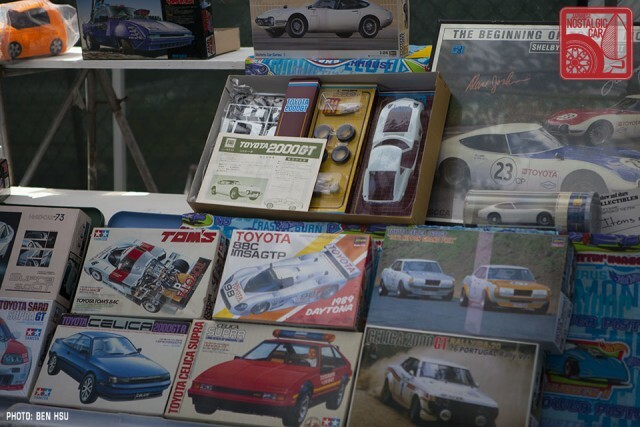 Another display of vintage Toyota memorabilia included rare model kits, posters, advertising and promotional materials and diecast cars going back 40 years. 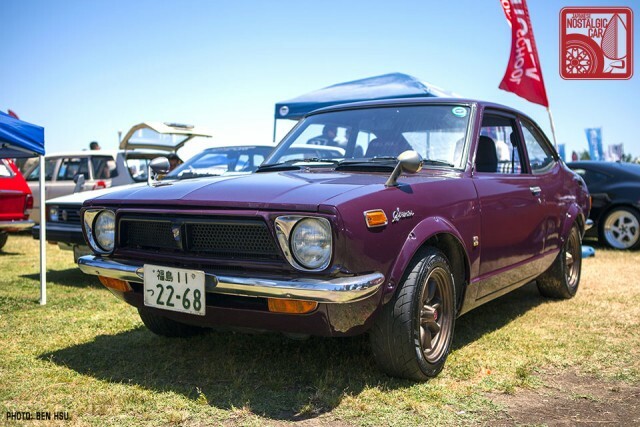 While Supras and AE86s typically get most of the spotlight, each year Toyotafest issues a Toyotaku award for the car that most represents a dedication to the marque. 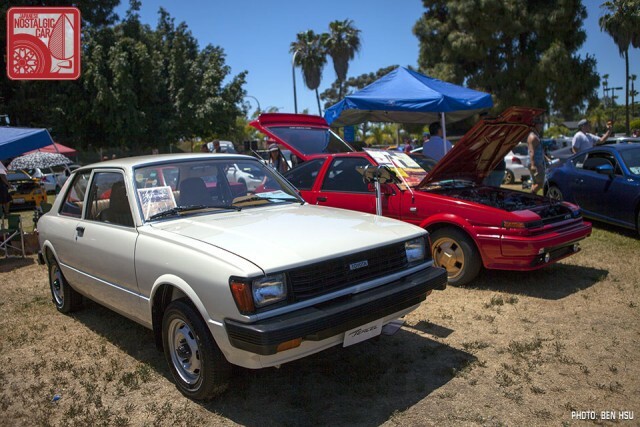 This year, the prize went to Edgar Briones’ bone stock 1982 Tercel. It looked as if it had arrived directly off the showroom floor over 30 years ago, and it was great to see an typically overlooked model get some love. 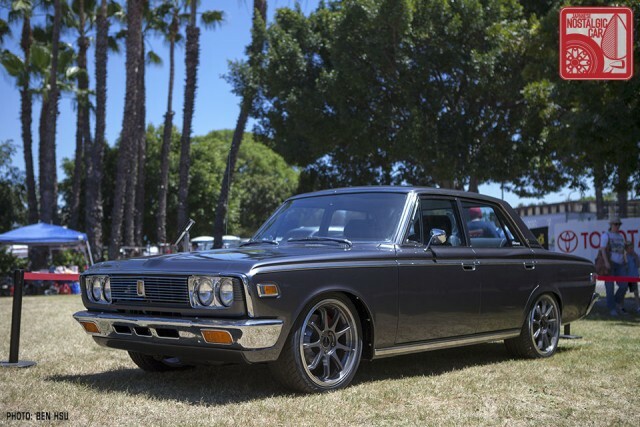 In the end, it was Janet Fujimoto and Duane Tomono’s incredible 1970 Toyota Crown that took home the Best in Show award. Rescued from a very old and very neglected Crown that had been sitting in the California sun for years, the car was given a second life as a resto-mod that reminds very much of the Mooneyes style. 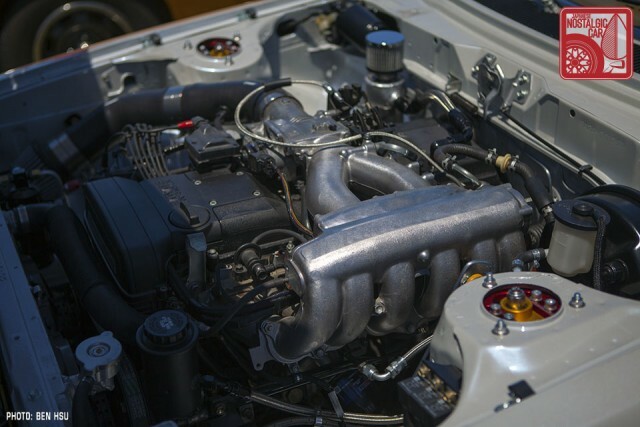 The defunct 2M that originally sat beneath the hood was traded for a modern 2JZ-GE, the last of the great Toyota straight sixes. 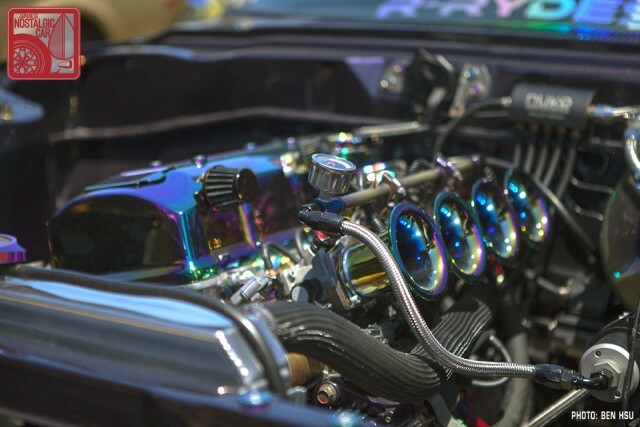 The swap necessitated custom engine mounts, transmission mounts, and driveshaft, while a Koyorad aluminum radiator cools the beast. 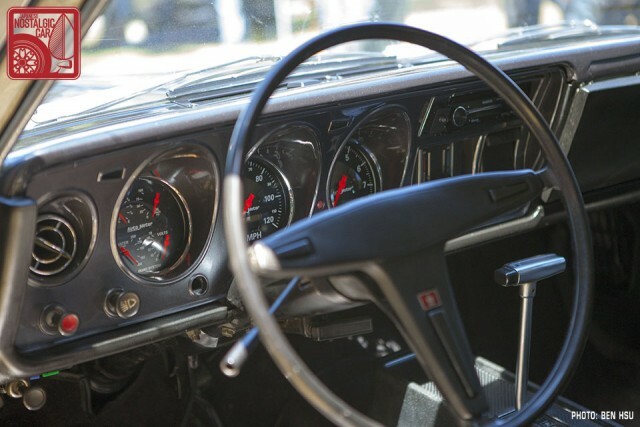 The entire wiring system was redone, and if you peek inside the instrument panel has been modernized with a host of Autometer gauges. Hidden behind Enkei RSM9 wheels, 4-pot Brembo brakes in the front and 2-piston units in the rear address one of the hairiest aspects of driving an old Crown. Twenty years is a long time for any show. 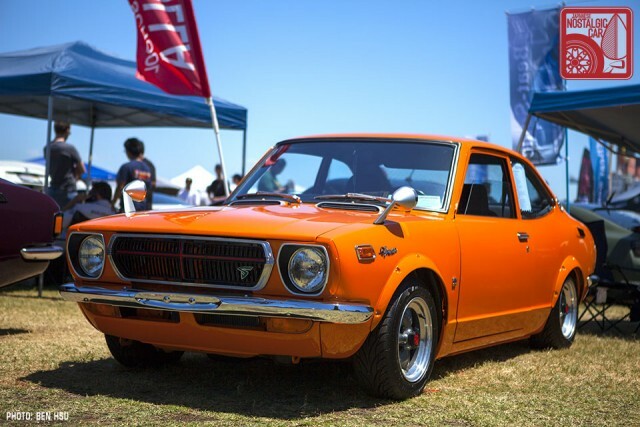 To put it in perspective, Toyota’s entire Scion brand has only been around for half that time. 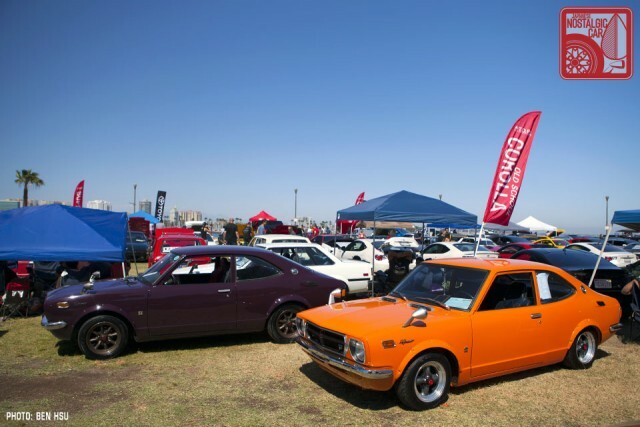 With registration that sold out in less than 24 hours, the gathering of Toyota enthusiasts shows no signs of slowing down. We have gotten reassurance from Toyota that they will continue to support the event even as they move the headquarters to Texas, so here’s hoping for 20 more. 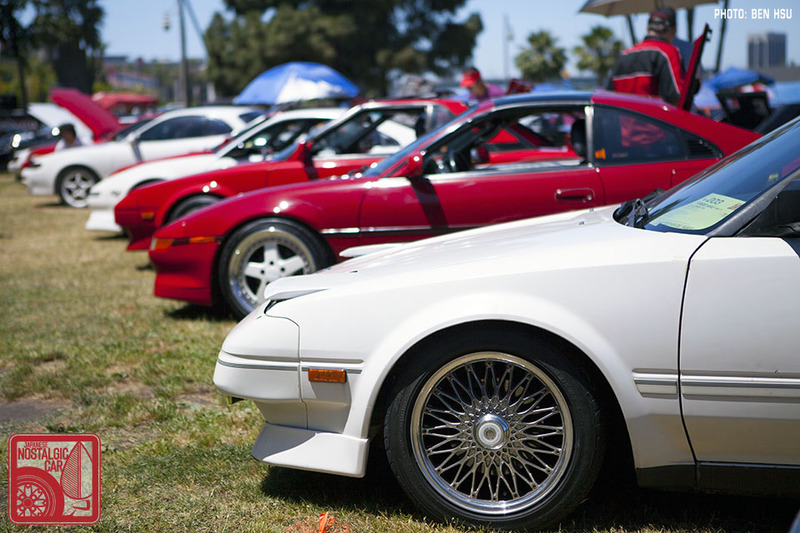 This concludes our coverage of the 2015 Toyotafest. 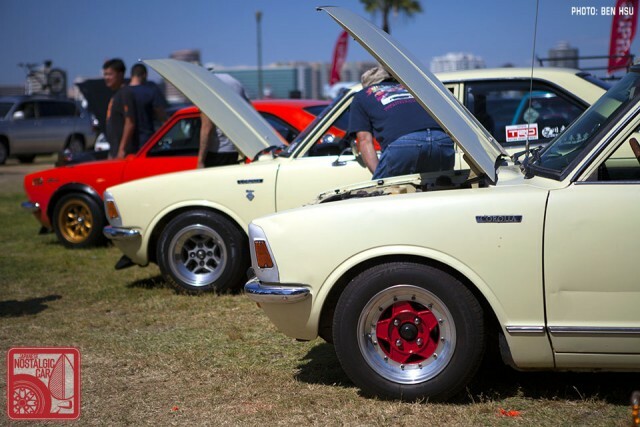 In case you missed it, here’s Part 01 and Part 02, as well as coverage from Toyotafest 2014, 2013, 2012, and 2011.
tagged: a20, a60, a70, ae86, aw11, corolla, crown, e20, fj40, fj60, hilux, land cruiser, mr2, Spinter Trueno, sports 800, supra, sw20, tercel, toyota, toyota celica speedster, toyotafest, W30. 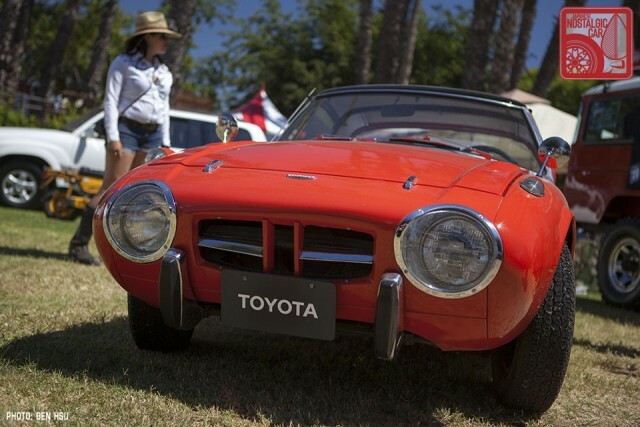 I have that same 2000GT kit, it looks like the Otaki version. Great show report guys !! It pains me to see that Back to the Future Hi-Lux. I almost bought a very similar (and very clean) ’87 SR5 replica last year, but decided on getting a C10 pickup. I think it ended up selling for under $8k with 300k on the odometer, of course that’s not that much for a 22RE. Probably the best racing game ever! I am hearing the game music in my head now. So many awesome 4x4s! Thanks for posting. If you guys have any more pictures of the purple TE27, would you mind sending them to me at jkwade@gmail.com? Mine is approximately the same factory color, and it has been very difficult to find pictures of others in that shade! 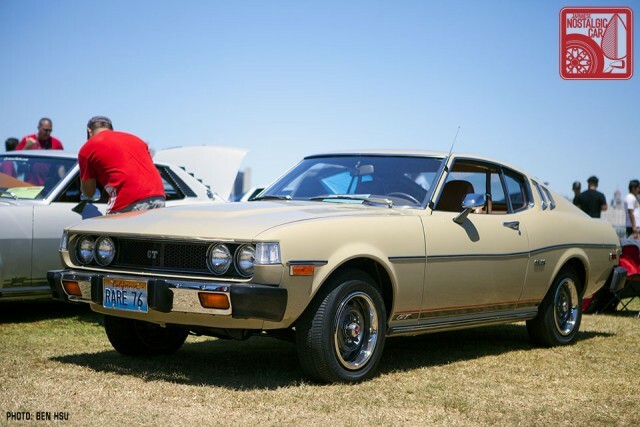 My first car was an 82 tercell… It was terrible. ZZ23X Celica lurking in the background like the shunned child LOL My favourite car in NFS Underground 1! 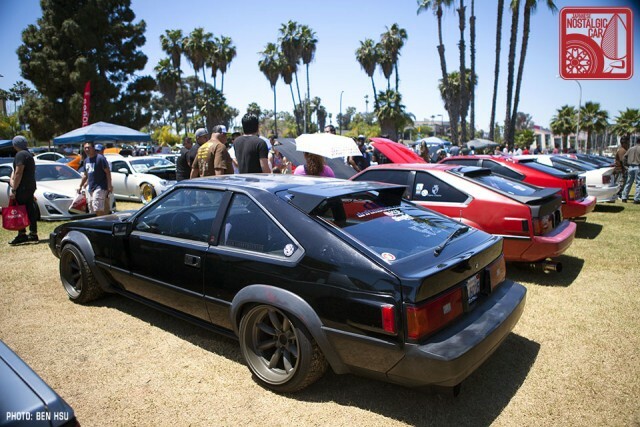 Everyone always overlooks the later gen celicas – one day FWD coupes will be cool, one day! The Fujimoto / Tomono Crown as a restomod looks nicely restrained. Wheels, even the cereal packet prize Auto Meter gauges look nice! A first for me for sure… Overall a great looking machine! I like the Mad Max Supra too for some reason. Perhaps its lived-in look, or just that near murdered-out cars still appeal. 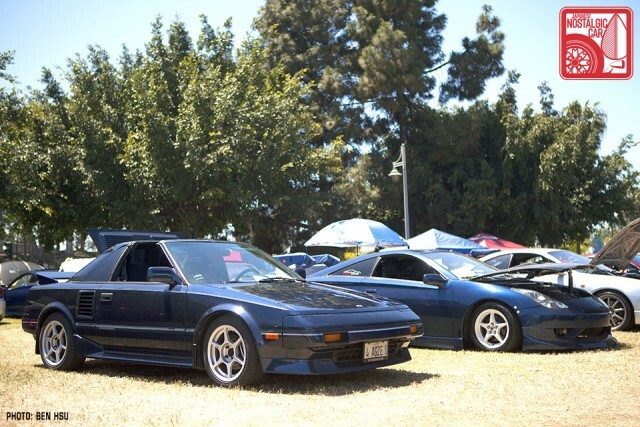 Hey that’s my blue supercharged aw11 from Chicago !